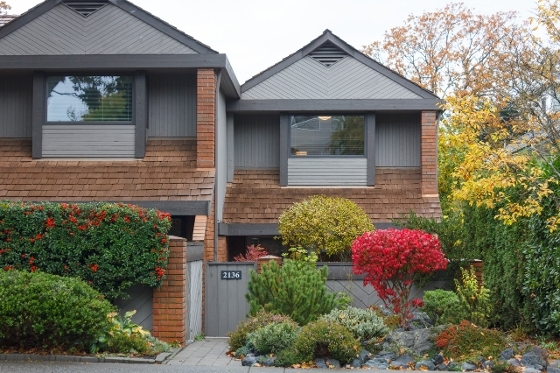 Nestled in the heart of the Oak Bay Village is your lovely 2 level townhome with updates galore. You will love this south east end unit, with neighbours only on one side, and rear lane access. The main level offers large, bright living room, updated kitchen with stainless steel appliances, and 2pce bath with insuite laundry. Meander upstairs to your spacious master bedroom, completely renovated bathroom with over $15,000 in upgrades and kohler fixtures, and second large bedroom. Step outside and enjoy your private, fully fenced front yard. Close to grocery shops, shopping, transit, beaches, parks and so much more. Don’t miss out on this rare find in Oak Bay! Call Today!